Diana Krall, Jane Monheit, Dee Dee Bridgewater, and Natalie Cole - these are the stars that have caused a worldwide furore with their full-blown movement back to the "standards". It comes as no surprise that the interpretation of the well-known ballads that make up a large portion of "The Great American Songbook" has always been considered one of the highest disciplines in jazz. At first glance Nils Landgren might seem a bit out of place in the midst of this illustrious group of women. Landgren - isn’t that the guy with the fiery red trombone who continually brings the concert halls to the boiling point? Yah - that’s him. But God knows the Swedish jazz trombonist has more to offer than rock-hard, groovy funk. When it comes to ballads, Nils Landgren is an old hand. And Nils could sing practically from when he could talk. Nils remembers with amusement that, "In school we had to sing a psalm every day, which definitely didn’t arouse my enthusiasm for singing." It was a convincing performance in the best James Brown manner that got the 18-year old Landgren his first recording contract. Since then Nils Landgren has never completely stopped singing, regardless of all the success of his formidable band Funk Unit. To the great surprise of those who know the music industry, Landgren’s 1992 "Ballads" album (ACT 9268-2), which was brought onto the market without a lot of publicity, evolved into a real word-of-mouth hit. Almost 20,000 copies were sold - that speaks for itself - such a turnover is a more than respectful success in the jazz world. And so "Mr. Redhorn" once again gives way to his sensitive side and undertakes a trip to the land of emotions. "Sentimental Journey" - could there be a more appropriate title for an album from someone who is almost always speeding from one gig to the next, but who would like to shift down a gear? Nils declared that, "After all the hectic tours in this last period, it was simply the right time to do this album. I’ve always liked quiet songs that tell a story. It doesn’t make much difference to me whether I tell that story with words or with my instrument." And there is a whole list of such stories: "In a Sentimental Mood", breathed in the characteristic style of the greatest jazz musician of them all, Duke Ellington. Kurt Weill’s "Speak Low", referring to the intimate moment of trusting togetherness. "Nature Boy", "My Foolish Heart", and the title song, "Sentimental Journey"; these are songs that belong to the standard repertoire of virtually every vocal interpreter in jazz. But Nils Landgren has also covered pop artists such as Sting, and it is clear that he has no reservations about tackling such country greats as Allison Krauss: "Fragile" and "Ghost in this House" are seamlessly added to the phalanx of song classics as if they had always belonged there. A lot of heart went into the making of "Sentimental Journey"; it is a project that is worked down to the smallest detail. What is more boring than a record on which every piece sounds pretty much the same? That’s not the case here. Every song has its own individual arrangement and stands alone in its beauty. Landgren is no friend of simple solutions - he’s not content with getting his ideas ready-made. Instead of using the usual string ensemble for an adequate background, he opted for the original FleshQuartet out of his Swedish homeland. Landgren intoned, "It’s damned hard to translate the ideas you have perpetually running around in your head into sounds, but I never thought it was possible that they could sound better in reality than the way I had painted them in my fantasy. I’ll always be indebted to the Fleshquartet for their contribution to this recording." One of the miracles of jazz is the ability of jazz musicians to accomplish the incredible without any previous personal contact. So said, witness and wonder at the results on "Sentimental Journey": "I don’t know why, but something inside me said that I absolutely should bring Anders Widmark, Lars Danielsson, and Wolfgang Haffner together," declared Nils. Certainly not a bad choice. The Swedish pianist Anders Widmark is one of the most versatile of his profession. A while ago he made a recording of "Carmen" which caused quite a stir. Bassist Lars Danielsson is one of the most sought-after players on the European jazz scene, as is indicated by the many albums he has recorded, both as bandleader and accomplished accompanist. And drummer Wolfgang Haffner’s biography could hardly be more colourful: alongside his work with his own formations, he is one of the most sought-after session drummers on the international scene. Besides this, the "special guests" include singers Rigmor Gustafsson and Viktoria Tolstoy, along with Nils’ labelmate and friend, pianist Esbjörn Svensson. On the title song "Sentimental Journey" we also hear Nils Landgren with two of his students, trombonists Karin and Mimmi Hammar. 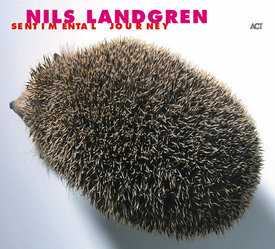 46-year-old Nils Landgren has travelled a long way before he could begin his "Sentimental Journey". He has been involved with more than 500 recording sessions (including ABBA), jazz workshops with some of the world’s most renowned big bands, successful international tours with the Funk Unit, artistic director of the 2001 Berlin Jazz Festival - the list could go on and on. One thing that makes "Sentimental Journey" so convincing is that it resists the hectic hustle and bustle that can overwhelm the music. Nils says adamantly that, "This is my baby, at least for a while." And what a beautiful, sweet, sentimental baby it is.